The focus is on Martha’s Vineyard but the information, fishing tips, and stories about Island characters—Bob “Hawkeye” Jacobs jumping off Memorial Wharf to unsnag an albie he hooked—will sound familiar to anyone who has spent time in a community of fishermen. 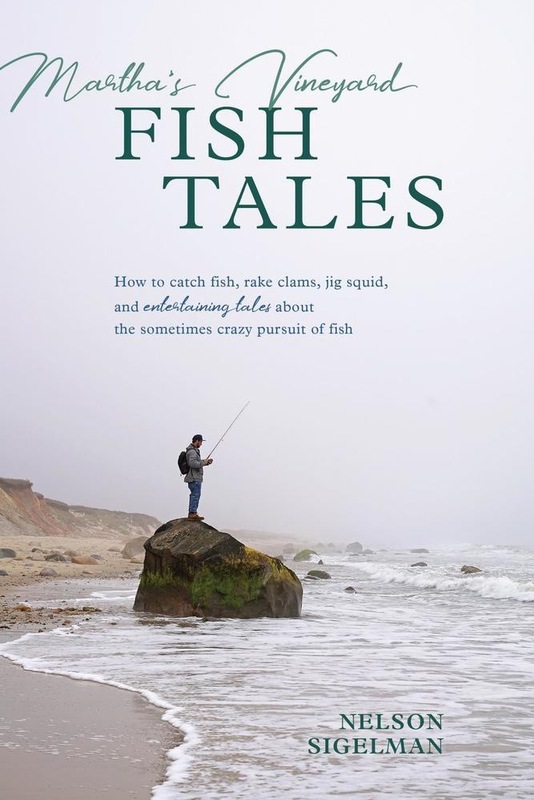 This informative and fun read answers the questions asked in local tackle shops, including the best spots to catch a striped bass on a fly rod—Lobsterville Beach—and rigging tackle for blues, fluke, black sea bass, false albacore, and bonito. Spin fishing, bottom fishing, and fly fishing are all covered. This book follows the island fishing seasons: rods appear on island trucks in April, a sign that schoolies have arrived, and they do not begin to disappear until the venerable Bass and Bluefish Derby, five weeks of single-minded pursuit of fish, ends in October. And there are tips on looking and talking the part . . . “handy phrases include any reference to a falling or rising tide and a rock, any rock, as long as you refer to it with a sense of authority so that the other person is unwilling to ask which rock for fear of seeming like a novice.” Martha’s Vineyard Fish Tales is a“how to” book that flows with the character and personality of a fishing-obsessed island off the coast of Massachusetts. Acquista Martha's Vineyard Fish Tales in Epub: dopo aver letto l’ebook Martha's Vineyard Fish Tales di Nelson Sigelman ti invitiamo a lasciarci una Recensione qui sotto: sarà utile agli utenti che non abbiano ancora letto questo libro e che vogliano avere delle opinioni altrui. L’opinione su di un libro è molto soggettiva e per questo leggere eventuali recensioni negative non ci dovrà frenare dall’acquisto, anzi dovrà spingerci ad acquistare il libro in fretta per poter dire la nostra ed eventualmente smentire quanto commentato da altri, contribuendo ad arricchire più possibile i commenti e dare sempre più spunti di confronto al pubblico online.